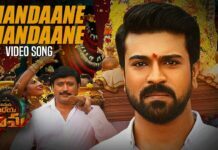 Mega Power Star Ram Charan’s ‘Vinaya Vidheya Rama’ has also begun its promotions. The Vinaya Vidheya Rama Movie is all set to be released on Jan 11. Vinaya Vidheya Rama teaser had attracted many eyeballs and garnered huge views on Youtube. The makers of the movie have doubled the curiosity levels of mega fans and cine buffs over the film with the teaser. Meanwhile, The first single from the film will be out on December 3rd. “The wait is over! Releasing the #VVRFirstSingle Thandaane Thandaane Song on 3rd December at 4 PM,” the production house tweeted. The Vinaya Vidheya Rama Movie Songs is composed by Devi Sri Prasad. Ram Charan teja is playing an action role. The full mass entertainer is being directed by Boyapati Srinu. Actress Kiara Advani is cast opposite Ram Charan and Bollywood actor Vivek Oberoi, Prashanth, and Aryan Rajesh played vital roles, DVV Danayya is producing the film.